Click here to download the floral arrangements available for purchase. Click here to download the stuffed animals available for purchase. Welcome to the Sarasota Memorial Hospital Gift Shop. 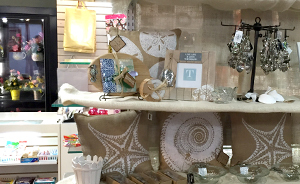 We offer a wide selection of unique gift items for our patients, visitors and employees. Our wonderful volunteers and staff look forward to helping you select the perfect gift. Whether it’s a new baby, get well, thinking of you, or special occasion gift, we are happy to work with you to create that special gift item to be delivered directly to anyone at the hospital. Our floral arrangements range from $10.00 - $55.00 or we would be happy to order a special arrangement that meets your individual needs. We can also add your personal message and have it delivered during our gift shop hours. Our colorful, cheerful selection of Mylar balloons is ideal for any occasion. Pair one with flowers and a card. We also have a full line of Greeting Cards, Magazines, Books and Candy. Indulge in boxed, individual bars or specialty treats. Plush, Blankets, Frames, Rattles… the list goes on of all the adorable baby items for your newest arrival. Looking for a fabulous gift? You’ll find a treasure trove of seasonal Apparel, Jewelry, Purses, and Accessories or from our Home and Garden Décor items. We also carry a full line of Lotions and Sundry Items to pamper someone staying with us - or yourself! We also make Custom Gift Baskets to suit any occasion. Ordering a gift for a patient is as easy as a phone call. Our friendly staff is here to assist you with gift ideas, gift selection and delivery to patients at Sarasota Memorial Hospital. We look forward to serving you and the guests at Sarasota Memorial Hospital.